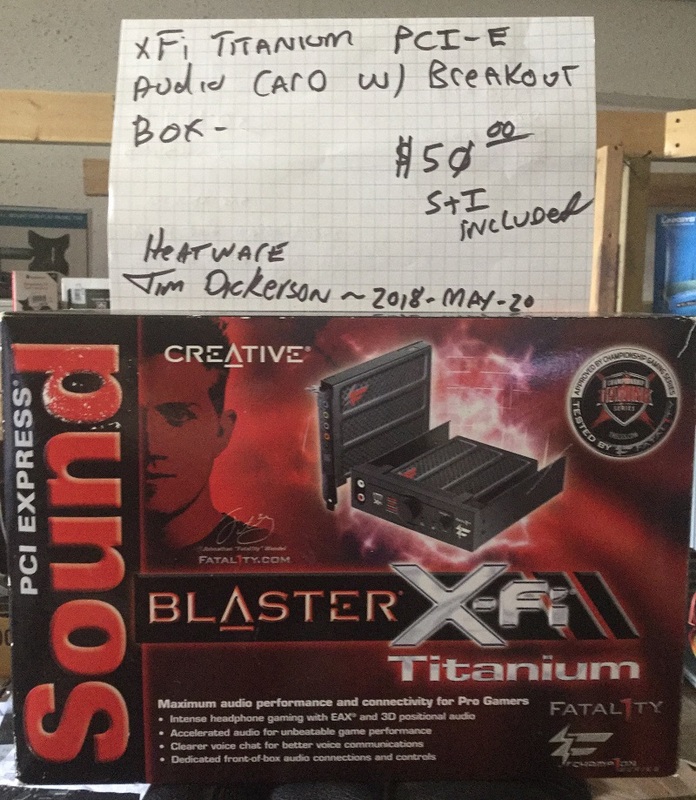 Description: Sound Blaster X-Fi Titanium Fatal1ty Champ1on PCI-E Gaming Sound Card w/ Break-Out Box. It may be old (2008), however, this card still holds it's own. 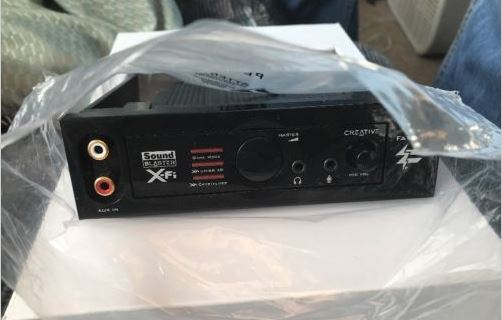 It comes with the break out box so you can connect the card and aux items to the front and control the volume from there. There are alternate (PAX) drivers for this card and I highly suggest people use them. They offer advantages (compatibility and other options) that the OEM drivers do not. Condition: Perfect working condition. I hot glued the ends of the connectors as they are very fragile. Physical condition is excellent. There are a few scratches/blemishes along the sides of the break-out box due to it being inserted into a 5.25" drive bay slot. 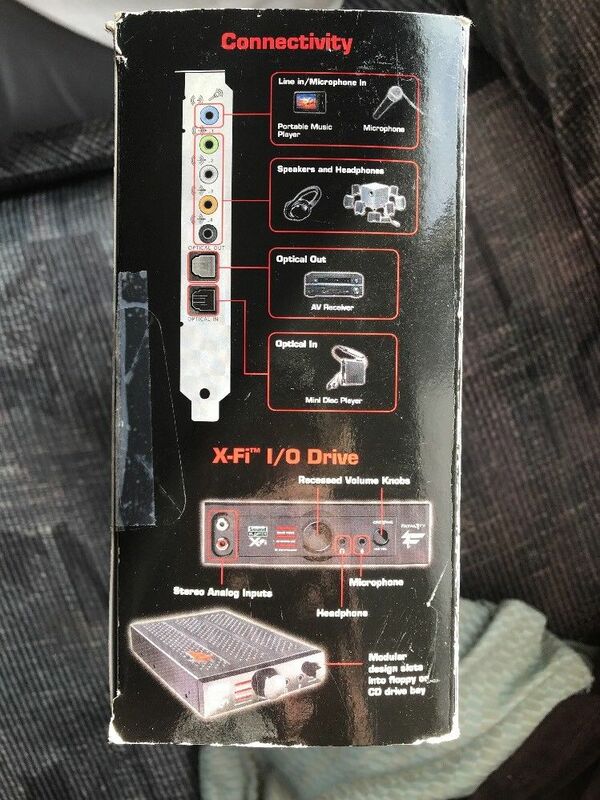 Accessories: OEM box, CD's, instructions & cables. Pay:Pal to: sales 'at' digital-audio-pro 'dot' us Cash: Via 'Will call' FOB in Sandwich, Illinois ~ 70miles West of Chicago. If you live within the area (20 miles or so FOB) we can arrange to meet 1/2 way or deliver to your house or business upon pre-arranging an appropriate time. While most of you know how to diagnose and troubleshoot, please feel free to message or email if you should have any questions in regards to what you purchased or for that matter anything else. You can use the same email address as our PayPal account as shown above. Like always, we will allow you to return ANY item (unless noted) within 7 days of receiving it. If you do return any item, you are responsible for any expenses incurred to do s. You MUST include all accessories, the included box and any paperwork (receipts & shipping docs). Please make sure you insure the item for the price you paid. Upon receipt of any item in which there is shipping container/packaging damage severe enough to render the item inoperable or shows physical damage, please contact us ASAP and take pictures of the damaged packaging and/or item(s). This will allow us to initiate the process of filing a claim. Any pictures will do...just as long as the damaged areas are clearly shown. I will immediately offer a replacement item of the same type (if on hand) OR I will refund your entire purchase price via PayPal.